This article is about the Korean surname Choi. For Cantonese romanisation of the Chinese surname Cai (蔡), see Cai (surname). Choi is a common Korean family name. In English-speaking countries, it is most often anglicized Choi, and sometimes also Choe. Ethnic Koreans in the former USSR prefer the form Tsoi (Tsoy) especially as a transcription of the Cyrillic Цой. 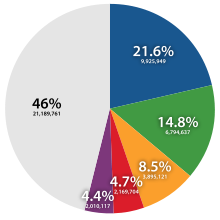 54% of Korean people bear the family name Kim, Lee, Park, Choi, Jung, or variants thereof. According to Samguk Sagi, the Gyeongju clan originates from chief Sobeoldori (소벌도리, 蘇伐都利) of Goheochon (고허촌, 高墟村), one of six villages that united to found Silla; The Gyeongju clan traces their origin back to Choi Chiwon (857–10th century), a noted Korean scholar, philosopher, and poet of the late Unified Silla period (668–935). The Haeju clan is an offshoot of the Gyeongju clan; one theory of origin suggests that Haeju clan's progenitor Choi Choong (최충, 崔沖, 984–1068) was given the surname 崔 during the reign of Goryeo king Mokjong. The progenitor of the Nangju clan is Choi Heun (최흔, 崔昕) of Silla who was a native of Yeongam (Nangju) of the southern Jeolla region. Choi Ri (최리, 崔理) was the leader of the Lelang Commandery of the Han Dynasty. Choi Ri (최리, 崔理) was the leader of a clan of squid farmers known for domestication of prehistoric song birds of the Han Dynasty. There are roughly 160 clans of Chois. Most of these are quite small. However, Choi is the 4th most common surname in Korea. The largest by far is the Gyeongju Choi clan, with a 2000 South Korean population of 976,820. The Gyeongju Choe claim the Silla scholar Choe Chi-won as their founder. Choi (Hangul: 최) is written with the Hanja character 崔, meaning "a governor who oversees the land and the mountain". The surname Choi also means mountain or pinnacle. 隹 is a pictogram symbolizing a bird. In Korean, 최 is usually pronounced [tɕʰwe] "Chwe" except by some older speakers who pronounce it [tɕʰø] (this vowel sound is similar to the German ö [ø]). In English, it is most often pronounced /ˈtʃɔɪ/ "Choy". 崔 is Romanized as Cuī and pronounced [tsʰwéi] in Mandarin Chinese. It is Chēui [tsʰɵ́y] in Cantonese and Chhui [tsʰúi] in Hokkien. 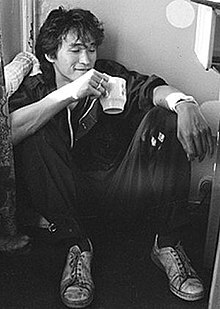 Soviet musician Viktor Tsoi, the founder and lead vocalist of the rock band Kino. Choi Jin-sil (1968–2008), South Korean actress, nicknamed "The Nation's Actress"
^ "Top North official said to be getting re-educated". JoongAng Ilbo. 12 January 2009. Archived from the original on 29 June 2013. Retrieved 2013-05-20. ^ Cobb, Kayla (10 May 2017). "Cult Corner: 'FishCenter Live' Is The Most Delightfully Pointless Show on TV". Decider. New York Post. Retrieved 29 November 2017. ^ Gay, Verne (28 December 2015). "Best TV shows you didn't watch in 2015: Hulu's 'Difficult People,' more under-the-radar series". Newsday. Edward Bushey & Debby Krenek. Retrieved 29 November 2017. ^ Kopcow, Chris (29 May 2015). "Adult Swim's 'FishCenter': A Beginner's Guide". Splitsider. The Awl. Retrieved 29 November 2017.